Specially priced Leadership Tip Combo Pack containing 52 Bulletproof Leadership Tips, and 52 Bulletproof Leadership Tips, Volume 2 for a total of 105 great tips to improve employee morale, accountability, and performance. 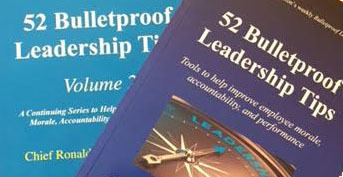 52 Bulletproof Leadership Tips – Volume 1 contains a full year’s supply of Ron’s weekly Bulletproof Leadership Tips. It contains practical leadership information every manager and supervisor can use to help improve employee morale, accountability, and performance.